The Vinaceous-breasted Amazon (Amazona vinacea Kuhl, 1820), in Italian, Amazzone vinata, in German, Taubenhalsamazone, in French, Amazone vineuse, In Spanish, Amazona vinosa, is a parrot afferent to the order of the Psittaciforms (Psittaciformes), family Psittacids (Psittacidae), genus Amazon (Amazona), of the Neo-tropical bio-geographic area. It is not a polytypical species, therefore do no exist, apparently, subspecies referred to the nominal species. The vinaceous-breasted Amazon is enlisted into the appendix I of the Washington Convention, 1975 (Convention CITES), and this hinders its commercial traffic. It is a species present in the “red list of endangered species” of the IUCN. 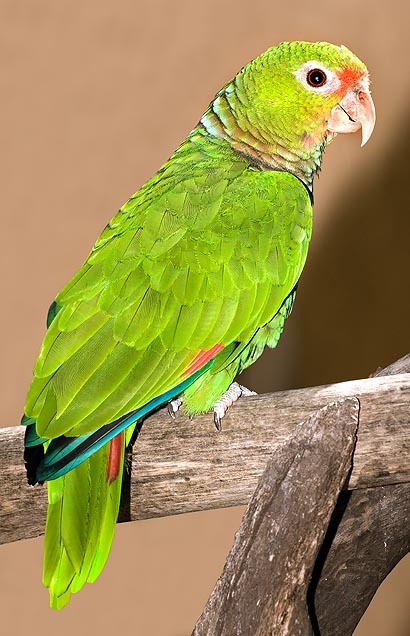 This parrot is autochthonous in the north-east of Argentina, in the province of Misiones, in the south-east of Paraguay and in the south-east of Brazil, south of the state of Bahia and north of the Rio Grande do Sul. The vinaceous-breasted Amazon tends to localize in the forests, humid as well as dry, of the plains, in the tall secondary vegetation, and in the humid mountain forests, up to 1.100 m of altitude. In these locations, it prefers the trees of the genus Araucaria, but loves also the woodlands, rich in bamboo and in epiphytic vegetation. Their alimentary ecology is based on the seeds (especially those of Araucaria), the leaves of eucalyptus and of Guadua bamboo, the pine needles, and the sprouts of bamboo. They nourish also of the fruits of the forest, with a particular interest for those of the palm Euterpe edulis, called juçara, açai-do-sul, palmiteiro or jucara, according to the various local populations, and probably, as many Amazons, of flowers, buds and nuts. It is found, at times, on the clayey soils, rich in minerals, while eating the earth. Ephemeral flocks frequent the orange plantations. In some of the mentioned geographic areas, the Amazona vinacea has now disappeared, or little populations do remain. The serious demographic decline to which it is subject depends on the continuous deforestation for getting agricultural fields, not to forget the poaching for their sale as ornamental birds. 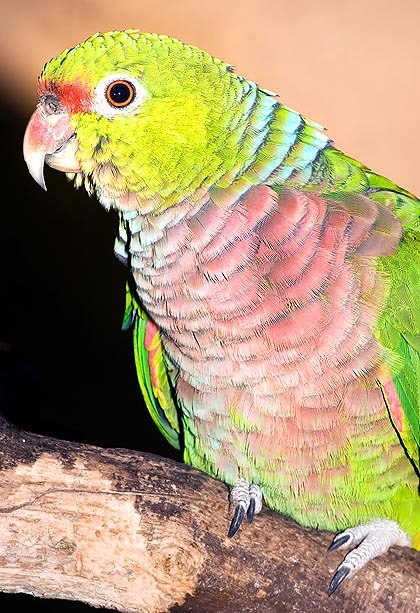 The green is the dominant colour of the plumage; the front has a red dot. The throat, the chest and the abdomen have a red wine-mauve colouring, from which comes the name of vinaceous Amazon. The nape has some bluish tinges. The feathers of the occipital portion of the skull, those of the head and partly those of the abdomen, are bordered of black. The edge of the wings is green, variously suffused by red and yellow feathers. The primary coverts are green with blue tips; the remiges are red and form, together with the red component of the wings, the speculum. The green of the back is paler, the portion under the tail and the flight feathers is greenish, the overlying area is green, and the tips are green-yellowish. The flight feathers inside the tail are red. The periophthalmic ring of skin is grey, the pupil is reddish with variously coloured small dots, the iris is red and the zygodactylous feet are grey. There is absence of sexual dimorphism, either seasonal or permanent. The immature pullets have a livery with paler colours, the red dot on the front is smaller and the chest is green in the lower part. They measure 30 cm, weigh 300 g and live for about 40 years. Usually, they are observed solitary, or in pairs or in small ephemeral groups. When they are in the resting areas, staying in their natural perches, even hundreds of individuals may be counted. The transitory groups dissolve shortly before the mating season, and this renders difficult their observation. Thanks to their docile nature, they often form associations with other species, such as the Red-spectacled Amazon (Amazona pretrei), the Red-tailed Amazon (Amazona brasiliensis) and the Scaly-headed Parrot (Pionus maximiliani). They perform social migrations, depending on the alimentary availabilities. Their flight is fast, characterized by powerful wing beats; the call is hoarse and croaking. In Argentina and in Paraguay, the mating season goes from September to January; in Brazil it’s a little later. In some locations there is even a second mating time, by March. The male usually builds up the nest in the hollows of the trunks of Araucaria, but also, occasionally, among the rocks. It is not rare to meet colonies of nests, and these may even be placed at 2 m of depth inside the hollow. The female usually lays 2 to 4 eggs which measure as an average, 3,8 x 2,92 cm. If we are in the first mating season, that falling between September and January, there may be 3-4 pullets, if we are in the second mating time, there will be 1-2 pullets only. In both cases, the incubation lasts 25-27 days and the pullets are fed till when they fly off, that is for about 70 days.